More than 18,000 people are suffering from illnesses linked to the dust from the attacks on New York's World Trade Center on 11 September 2001. The figure comes from the US government's monitoring and treatment programme for 9/11 emergency workers, volunteers and local residents. The most common afflictions are respiratory problems including asthma and sinusitis, but muscular and intestinal conditions are reported as well. The senior US official managing the health legacy of the attacks warns that early deaths are possible among the survivors. Dr John Howard, Director of the National Institute for Occupational Safety and Health, told BBC News it was "plausible" that people would die of exposure to the dust. He singled out damage to the lungs - interstitial fibrosis - as one of the most serious effects. "You lose capacity to exchange oxygen and carbon dioxide, and essentially your lung is forming a scar inside so you have less ability to breathe." Dr Howard said people could die of "many of these conditions that we have seen associated with these exposures". The dust - which blew though neighbouring streets and settled over Lower Manhattan - contained a dangerous mix of chemicals. Researchers found a high proportion of highly alkaline particles from the pulverised concrete, but also asbestos and heavy metals like lead and mercury from thousands of computers and lights. Nearly 3,000 people died when the two 110-storey buildings were destroyed - the single greatest atrocity on US soil - but those who rushed to help are among potential victims of a toxic fallout. Up to 80,000 people - including firemen, police officers, emergency workers, contractors and cleaning staff - are believed to have been present in the aftermath. Soon after the attacks people reported what became known as "World Trade Center cough" but symptoms have since become more serious. "There is no question that thousands of World Trade Center responders have developed chronic, disabling illnesses as a result of their horrific exposures. "Based on accumulated knowledge and medical science, occupational medicine physicians have now learned that, for many responders, WTC-related physical and mental conditions are likely to be permanent. "Sadder still, new patients are still being seen who haven't been evaluated before or treated." Most focus has been on the firemen who led the effort to search for survivors and, later, for remains. One major study of New York firefighters, published in the New England Journal of Medicine in 2010, found significant decreases in lung capacity - even six years after the attacks. This is seen as a highly credible finding because it involved no fewer than 12,781 people and included lung function tests conducted before and after 9/11. More controversial is the question of whether the conditions associated with the dust have so far caused any deaths. 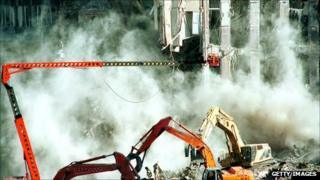 In 2006, a New Jersey pathologist ruled that a detective, James Zadroga, died of lung disease that was linked to WTC dust. The finding was later challenged by the New York medical examiner, but the detective's case was deemed serious enough to merit his name being given to new legislation. The Zadroga Act, passed in December 2010 and written into law in January this year, authorises $4.7bn (£2.9bn) for monitoring, treatment and compensation for victims. Among the rescuers was police officer Jeff Endean, who has retired on health grounds including respiratory problems, headaches and sinus trouble. "The bad days are when it's very hard to breathe. There's a lot of coughing and anybody who's had bronchitis or something like that, the more you cough the more it hurts," Mr Endean said. "The headaches start and it inhibits you from doing many things. You can't run. I really don't run anymore. I haven't run since 9/11." "I see it getting worse for him. It's shorter periods of time between his infections and not being well and being sick. The periods of time are shorter and it is getting worse each time he gets sick." More recently, new categories of people have come forward with symptoms, including the army of cleaning staff deployed to rid Lower Manhattan offices of dust. Alex Sanchez was called to work near Ground Zero on 12 September 2001 and found "massive dust, green smoke, yellow smoke all over the place". His task was to clean the air ducts and ventilation systems. "What I saw in the dust was glistening particles of dust coming towards me, because I had a flashlight and this was a dark tunnel, so what I was illuminating was all these particles that I was breathing and digesting at the time." He worked in different buildings, but only in two of them was he equipped with a face mask. Mr Sanchez has since suffered from severe breathing difficulties, headaches and gastric problems, and is assessed as unfit to work. Architect Enzo Ardovini had worked in the rubble and has since suffered from a series of conditions related to his memory. "I couldn't remember things, and every time I went for check-ups, they were checking my lungs," Mr Ardovini said. "They were checking my shoulder, and I kept on saying to those doctors, 'I'm fine from here down. Something's not right with my brain, so you need to check.' "
Mr Ardovini is now one of thousands claiming compensation for their injuries - a move provided for under the Zadroga Act. His lawyer, Troy Rosasco, warns that many illnesses, such as Mr Ardovini's memory loss, will only emerge in the coming years. "This is just the beginning. This is not - 10 years out - the end," Mr Rosasco said. "We're going to be facing people getting sick with 9/11 related injuries and illnesses for another 20 years at least."